Your Brain on Computers – Overuse of Digital Devices May Lead to Brain Fatigue – NYTimes.com – Completely agree with this idea… have been enjoying unplugging on the evenings and weekends lately. IDEO | BBVA – IDEO's project with BBVA Bank to redeisgn their ABMs. Some interestig stuff but my big question is what about accessibility. How are visually-impaired people supposed to use a touchscreen ABM? Anyone who’s dug around in the “Everyone’s photos” section of Flickr has probably realized that the people who submit pictures to the site come from all over the world but oddly enough, up until now, Flickr has only ever had an interface in English. 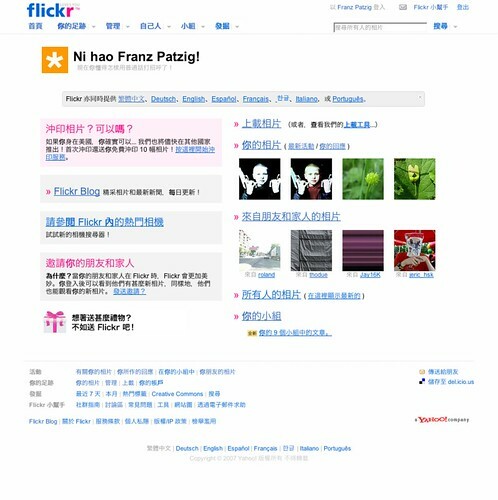 I noticed the other day that there was a new title bar across the top of the screen offering up the fact that Flickr was now available in a multitude of languages. On top of English, Flickr is now available in French, German, Korean, Italian, Portuguese, Spanish and Traditional Chinese. Localized interfaces are something that, more often than not, I’ve found the Web 2.0 apps are lacking. Most are aimed squarely at US English speaks and that’s it. Amusingly enough the trend that has emerged is companies in foreign countries creating the same tool but in their local language. A German-based Digg clone was acquired for many millions – a huge number when you consider it was a market that the company could likely have served for want of some localization work and global thinking. Instead they left the door open for someone else to walk right into their market, leverage their effort and ideas and then take a huge chunk of money off the top as they get acquired. Any company that offers a software product, thick client or web-based, should take these types of lessons as a reminder of the importance of thinking beyond North America’s borders.